So, I just recently wrote up my My Travel Memories for Lexington (and maybe Louisville) Kentucky. My photo album has us going through Springfield in 1980 and then has some things from Lexington. In the process of scanning in postcards, I found one that my mom mailed to me, postmarked 1983, that references our first trip to Cincinnati. But all of the photos of Cincinnati that I can find are from 1987. Our 1980 photo album abruptly jumps to my first date, in 1982, after Lexington. So, after discussing possibilities with my dad, we have come to the conclusion that the trip to Cincinnati referenced in that postcard must have been in 1980. If I eventually find some evidence that it was in some other year (despite Cincinnati being out of the way for any of our other destinations) I will change it, but the way things stand now, it sure looks like we were there in 1980, so I will write it that way. I think we also went to Detroit that year, and perhaps Cleveland, as well. Sea Wolves is about, well, wolves that live near the sea. Apparently, scientists generally considered the wolves that they saw on the beach of the coast of British Columbia to be ordinary forest-dwelling wolves that were searching for food at the beach. But recently, scientists have begun studying the wolves that they see near the shores and they have discovered that the wolves never really leave the shoreline. They live on barnacles and dead whales, but during spawning season, salmon can make up to 25% of their diet. The shore-dwelling wolves also mate pretty much exclusively with other shore-dwelling wolves, so the populations are totally distinct from one another and are likely to become more so. Of course, the local residents had known most of this for years. It just took a little longer for the scientists to catch up, apparently. Yep, that’s the title. Don’t ask me. Kern is a photographer who has always has liked reptiles and invertebrates and other “icky” animals. He first takes a photograph of said animal and looks for patterns, colors, shapes, and so forth. Then he uses that to build an abstract photograph of the animal in order to show off the beauty of the animal. In this article, we see Kern’s original photographs and his abstract art based on those photographs for a bird, a snake, a tarantula, a millipede, a mantis, and two different species of chameleon. I think the millipede is my favorite. The original animal has red legs and black-and-white stripes on its shell. I have a very high tolerance for bugs and things. I’m the only person I know who, when asked, “Would you like to (hold/touch) (name of “icky” creature)?” almost always says “yes.” I’ve been able to hold, touch, and/or pet several species of snake, a tarantula, and a bat, among others. For anyone reading this who is worried about my rabies status, the bat had been confiscated from traffickers and it was impossible to repatriate it, so it was given into custody of a trained professional bat-handler. She had had custody of it for several years by then, so I knew that it wasn’t infected with rabies or ebola or anything. The fur was, by the way, incredibly soft. We also toured the house that Abraham Lincoln had lived in when he and Mary Todd Lincoln lived in Springfield. It was, as they all are, really, a house. 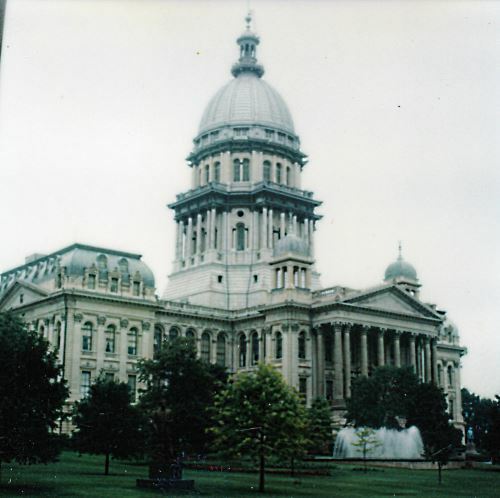 I don’t remember going into either the Illinois State Capitol building or the Old State Capitol Historic Site, but I do remember seeing the outside of both. I think we may have just driven through Springfield on our way to our next destination, Lexington, Kentucky. Alex and I went downtown this weekend looking for the perfect San Antonio Christmas picture. We took pictures of the Bexar County Courthouse and of the front of San Fernando Cathedral (the cathedral was undecorated, but Main Plaza was pretty empty, so I figured this was as good a time as any to get a really good picture, which I need to resize and crop and put on my post on the cathedral). I also took pictures of the Christmas tree in Main Plaza and then we hiked to Alamo Plaza and I took a picture of the Alamo with a wreath over the door and of the city Christmas tree (which was decorated with ornaments shaped like basketballs and Spurs logos, which is definitely unusual, but not what I was looking for). When I wrote my post on the Museum Reach section of the River Walk, I realized that I wasn’t sure if I’d walked the whole thing from downtown. So while we were downtown, we walked the River Walk from the Paseo del Alamo (which leads from the space between the buildings across from the Alamo, down through the entrance of the Hyatt Regency hotel and then out into the River Walk proper. We made a right and walked kind of east and north from there to the locks and dam (and I know that I’ve covered everything from the locks and dam to the Witte Museum, so I am no officially done with the Museum Reach section of the River Walk). 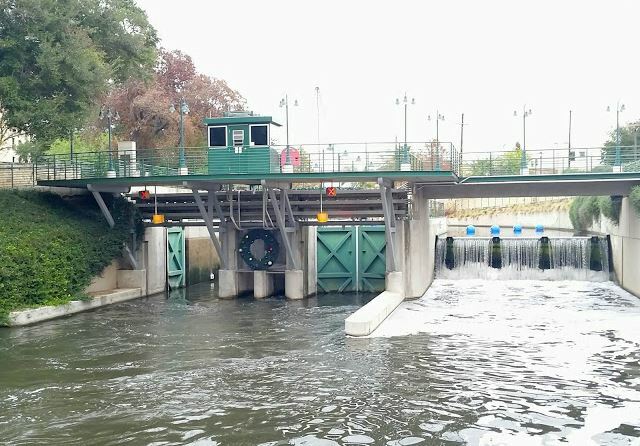 And there I saw the perfect picture — they had hung a wreath on the front of the dam. I then spent the next few days massaging the picture in an effort to make the wreath stand out more. I ended up just cropping the original a bit and then writing a few paragraphs to explain how I came to take this photo and to point out the wreath, just in case you miss it. San Pedro Springs Park which has also been known as just “San Pedro Park” in the past, is (depending on how you count) the second-oldest public park in the United States. The land where San Pedro Springs Park currently is was set aside for public use by the King of Spain in 1729, making it 95 years younger than the oldest public park in the United States, Boston Common. The “depending on how you count” is because the Trust for Public Land, which apparently uses different criteria for “park” places San Pedro Springs Park at tenth-oldest. Either way, though, San Pedro Springs Park is one of the oldest parks in the country. Humans have been living in and around the area that is now San Pedro Springs Park for millennia. When the Spaniards arrived in 1709, the area was home to a Coahuiltecan tribe known as the Payaya. The Spaniards knew a good thing when they saw it, so they decided to move in there, as well. Unfortunately, there were two groups of Spaniards — soldiers and Franciscan missionaries and there was apparently some kind of conflict between them. Eventually, the missionaries set up on one side of the river and the soldiers on the other. This is the first of the missions named for San Antonio de Padua (the final one of these is the Alamo). The mission was moved to the other side of the river, then to where St. Joseph’s Church is today (I must remember the link when I get to writing up St. Joseph’s), and then to its final location. In what is likely to be the most confusing sentence I will ever write, parks today aren’t what they were then. Parks started out as land for sort of general public use. Boston Common, the oldest park in the United States, was originally a field where residents could graze their cattle. And so it was with San Pedro Springs Park. The original use was primarily for travelers, however. The travelers would let their animals eat and drink and refill their water containers in this area. It wouldn’t become a park as we recognize the term until 1864. Prior to 1864, one tenant of the land that is now San Pedro Springs Park was the military. Because of this history, the stone house in the park is generally thought of as an old fort or possibly a storage building for weapons. No one is sure where the building, generally known as the “Block House” was built, but a 1909 photograph shows a building that was already apparently old, and the architectural style looks to be from the mid-1800s. Among the uses that we are sure the military put the land to was the garrisoning of soldiers and stabling camels that the Army attempted to use in military campaigns. The park was also a prisoner-of-war camp during the Civil War. In 1864, a man named Jacob Duerler took over the park. He got a license to use the park for 20 years in exchange for fixing the damage done by the soldiers (and the camels) during the years when the military used the park. Duerler opened up a number of amusements including a fish pond and a bar. Duerler died 10 years into the 20-year period, and eventually his son-in-law took over. His son-in-law mismanaged the property and so when he wanted to break the lease early, the city allowed it. A new tenant, Frederick Kerbel, took over and made still more improvements to the park, including landscaping and the addition of a “grotto,” generally thought to be a summer home, which stands there today, and which looks kind of like a very large statue of Cousin Itt from The Addams Family. When Kerbel’s lease expired, the city took over management of the park. Some of the buildings built during the era when the park was let to tenants remained, including the grotto and a strange star-shaped structure that originally had a fountain in the center. When I first moved to San Antonio, the park had not been renovated for a long time and it looked sort of post-apocalyptic. They have done quite a lot of renovation, including upgrades to the swimming pool and the addition of a small skateboarding park. The park has a lot more visitors these days than I saw in my first visits, which is lovely to see. Since San Pedro Springs Park is a historic landmark, there are some places that are not handicap accessible. For example, the photo at the top of the page was taken at the top of a flight of stairs. The top of that sort of bluff thing is accessible by a sloped path, however. The “shallow end” of the pool actually is a ramp that leads into the pool, making the pool itself handicap accessible (though I’m not sure about taking one’s wheelchair into the pool itself), from what I have read. In this article, Draper and Maitre take the Congo River from Mbandaka to Kisangani (interestingly, Firefox’s spell-check likes “Kisangani.”). This is not where the journey was supposed to start. It was supposed to start in Kinshasa, at the lower edge of the navigable Congo River. However, the first boat they had paid to take, the Kwame Express, ended up not working out (to say the least) so Draper and Maitre arranged alternative transportation on a barge, which required that they fly from Kinshasa to Mbandaka (my fingers totally don’t want to type “Mbandaka.” I think it’s the “Mb.”). We meet some of the people on the barge and see their motivations for traveling this way and watch people along the river take smaller boats, called pirogues, out to the barge to buy goods, some of which are declared, but much of which is black market merchandise. When they arrive in Kisangani, Draper and Maitre take a day trip up the Lomami River, one of the tributaries of the Congo. It is hard to see the passage of time in this article, unfortunately, but at the beginning of the journey, Draper tells us that it is February, and they spend the day on the Lomami in November, so the trip took eight months (a number verified by a confusingly worded caption on a photograph of the Kwame Express). I know that I said once that I want to go “everywhere,” but after reading this article, I think that traveling up the Congo River on a barge has now been moved pretty close to the bottom of the list. If I end up with the time and money to do this after pretty much everywhere else (including most of Africa), I’ll consider it. The “Lost City” of the title is a reference to the Ciudad Blanca, a mythical city that is rumored to have once existed somewhere in the Mosquitia region of Honduras. For a long time, the consensus of historians and archaeologists was that there were no cities at all in that region. However, the imaging technique known as LIDAR (LIght Detection And Ranging) showed that there was an area in the rainforest that was consistent with the markings of an ancient city. The city that they found was a large one, with terraced fields in its outskirts and ten public plazas within the city. And what the archaeologists found was amazing. Apparently when the city was abandoned, no one ever disturbed it again. Most of the buildings had been biodegradable and they are gone now, but there are a large number of stone artifacts that were found in near perfect condition. And, to archaeologists, more important than the artifacts is the context — the location where the artifacts were found and how that location relates to the locations of other artifacts. If I am reading this article correctly, the context of these artifacts is perfect. In 2015, Lee Berger received a great deal of publicity for the discovery of a new relative of homo sapiens that has been named homo naledi. Part of the publicity was because of the finding and part was because of the way that Berger went about the investigation. The bones which later became homo naledi were found in 2013 in the dinaledi chamber of a South African cave system called Rising Star by cavers named Rick Hunter and Steven Tucker. The word “naledi” means “star” in Sotho. “Dinaledi” is Sotho for “Chamber of Stars.” The cavers were aware that Berger was looking for fossils, so when they found the bones in the dinaledi chamber, they brought them to Berger’s attention. And this is where the controversy comes in. Berger went to Facebook to recruit credentialed scientists who were small of stature. The way to the dinaledi chamber involves two passageways less than 10 inches (25.4 cm) wide. The six most qualified applicants were all female. Then, rather than keeping the discovery under his hat for years while he decided how to classify them, he crowd-sourced the classification. Berger had apparently around 50 scientists in to the site to help him classify the fossils. None of the scientists had seen anything like these fossils. Some of the teeth looked like modern human teeth, others looked primitive, and all of the other groups had the same experiences. The hands had modern carpals and metacarpals, but the phlanges were curved, and so on. Berger then added to the controversy by publishing in an electronic journal within two years of the find, rather than, again, sitting and waiting and publishing in a print journal. This article made me kind of uncomfortable, because I am mildly claustrophobic. It’s not pathological or anything — I can visit submarines and I climbed the Statue of Liberty all the way to the crown with no problem in 1988. But the thought of having only eight inches of clearance between me and freedom made me kind of tense while reading this article. Wild Heart of Sweden is about the Laponian Area World Heritage Site, one of the largest wilderness areas in Europe. Laponia is in the home region of the Sami people (formerly known as the Lapps). We follow Belt as he visits this region in company with the owner of a wilderness outfitting company and his summer intern (who is herself part Sami). And, once again, we get the beautiful photographs of the Haarbergs, whose work we last saw either two years or four days ago, depending on your perspective. When I saw that first photograph on pages 58 and 59, I thought, “Hey! That looks like that husband-and-wife team from last issue.” And I was right. I didn’t do it intentionally at all. It just worked out that way.